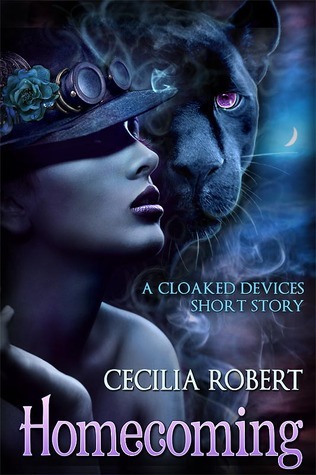 Audience/Genre: New Adult,Paranormal Romance with Steampunk elements. At least she didn’t squeal. She sounded confident. Not her heart, though. The poor organ was beating wildly, threatening to kill her before her seething mate got his large hands around her neck. “Please, come in.” Her mind grappled with her predicament, searching for another escape route. None came to mind. His feet were planted firmly on the floorboards, his shoulders blocking anything beyond her line of sight. Whatever scrap of hope to escape she’d had diminished like a lit candle plunged in water. He tilted his head gracefully to the side, watching her. “I see you are in good health.” His voice was low and soft and lethal. Levian took a step forwards; she took one back. He took another and she followed suit, and it became a dance of sorts until she felt something dig into her tailbone. She’d hit the farthest shelf in the deepest part of the bookshop. Panic became a living thing. During the first year after she’d arrived in Varselles, she’d nearly driven herself to destruction looking over her shoulder every time she heard a sound. One year later, she’d stopped worrying. She’d succeeded in hiding well. She’d never bothered with a contingency plan. Staring into those glowing green eyes, she wondered at her stupidity. She eyed him as he halted, slowly slid the leather gloves from his hands as if he had all the time in the world, then shoved them into his coat pocket. He flexed his fingers, his gaze roving her face, then settled for staring into her eyes. A series of emotions played across his face. What was he thinking? Other than probably strangling the daylights out of her? His eyes dropped to her mouth and his nostrils flared, eyes dilating. Well, now she knew what he was thinking about. Her tongue snuck out to wet her lips and she struggled for words—any words—to keep the tension that was now a living, breathing thing from swallowing her whole. The past few years she’d dreamed of the day he’d look at her like this again—minus the fury simmering in his eyes. But now, with everything just hanging in the air…. He swallowed the inch of space between them, and she tensed, and at the same time, swam in his scent: leather and that special soap he was fond of with its citrusy smell, and unique Levian. His smell was rooted inside every little crevice in her body. Hearing her name spoken in that voice by those lips had her stomach clenching and heating up at the same time. Damn it! Why was her tongue stuck on the roof of her mouth? She was the Storm. She wasn’t famous for being scared easily. Now she was treading in unknown territory, and it made her want to flee, and at the same time, fling herself onto the hard body of her mate and just let nature take its course. Her cat purred in agreement. At least on the last part. Calloused hands gripped her upper arms. He cocked a brow at her. “You don’t say.” He brushed her cheek with his knuckles. Flames licked her skin as his fingertips traced her throat, and when they skated over the dented spot on her nose—a souvenir from her first fight in the Rings four years ago—she wasn’t sure she was breathing anymore. His hand slid lower to unhook her bag from her shoulder, and he tossed it on the closest table, where it landed with a big thud. Without warning, he cupped her neck firmly, and his fingers worked out the leather band holding her hair. It tumbled around her shoulders in waves. “Much better,” he said, playing with a few strands between his fingers, and then he leaned down and buried his face against her neck, sniffing long and hard until she felt as if he’d breathed in every trace of her scent into his body. “You still have my scent. Deep in your veins.” His sounded smug, satisfied. Cecilia Robert lives in Vienna with her two children and has an incurable obsession with books, anything romantic, and medieval architecture. When not working in her full time job, she dons her supermom cape or, in most cases, finds herself trapped between the pages of a book in search of a hero who will make her swoon with just a look or a word. She believe there is always a happy ever after, no matter how long it takes for the characters to get there. Thanks for helping spread the word on Cecilia's new release, Kelly!